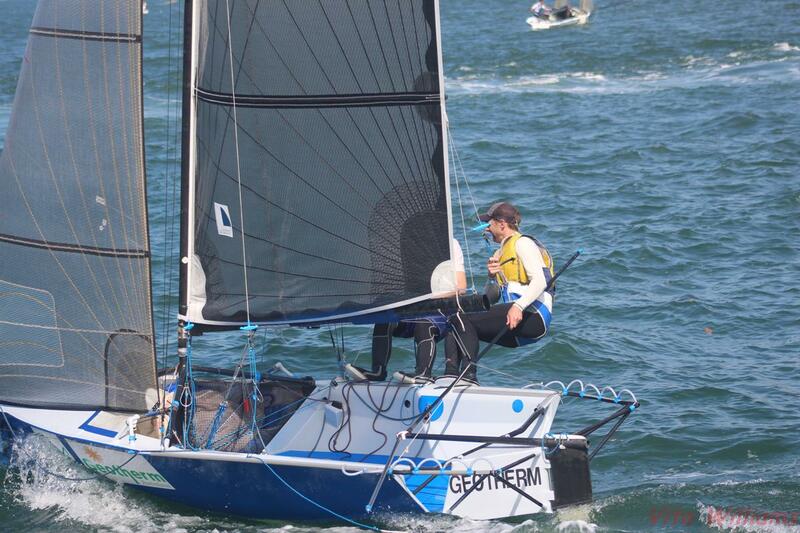 The Geotherm crew of Brett Hobson and Billy Lusty led the 12ft Skiff Parramatta River Championship almost to the end, only to be pipped to the post by the Sydney Sailmakers crew of Nick Press and Andrew ‘Noddy’ Hay in the Abbotsford Sailing Club hosted event late yesterday afternoon. Lincoln Crowne (Jonathon Temple/Richard Jones) and Arrogant Frog (Peter and Steve Hill) were fastest off the start, but Geotherm’s crew quickly headed east and hooked into a nice lift up the first beat, leaving the rest in their wake. Hobson, who lives at Abbotsford, and Lusty, from Berowra, looked to be in unstoppable form until the very end. 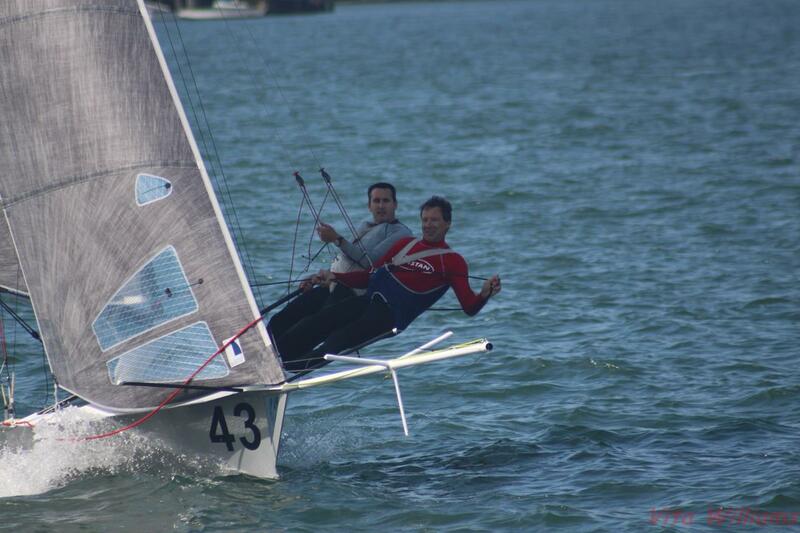 They made the best of a near-perfect 15-16 knot north-easterly breeze and flat water, which suits the skiffs to a tee. “Geotherm did a great job in the conditions. It was quite gusty and shifty, so there were lots of overtaking opportunities – some of your own making – some just luck,” Press, from Gladesville said, after Hobson and Lusty kept all-comers at bay, while there were changes in positions further down the course. “They rounded the final mark in front of us, but we were on his hammer by that stage. 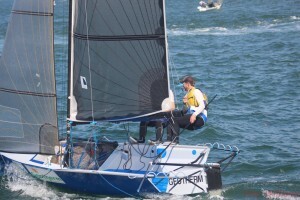 Brett elected to stay on port tack, while we got into a line of pressure and tacked, and we led to the finish,” Press said. 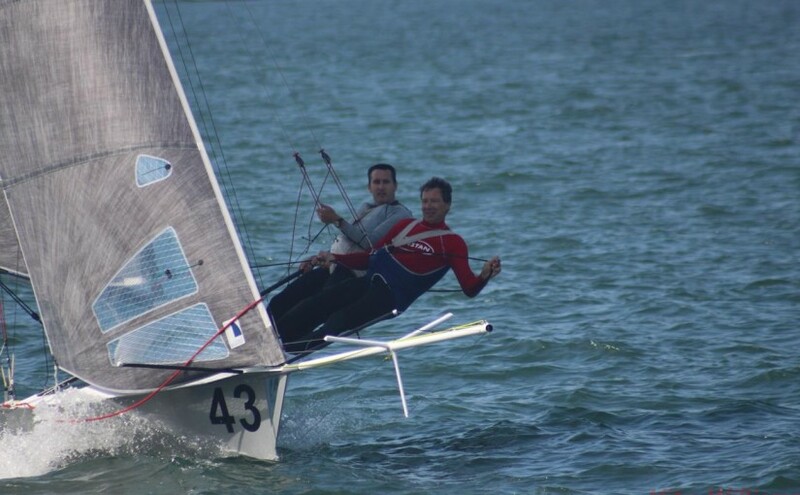 Hobson and Lusty threw everything they could at Press/Hay to prevent them from winning, but could not find the runway, so were forced to play second fiddle to Sydney Sailmakers once again, after being beaten by them in the Upper Harbour Championship last week. Just 31 seconds separated the two boats at the finish line. “Of course Brett and Billy weren’t happy with the end result, but this is only the third time they’ve sailed together, so I think better things are to come,” said Press, whose own crew, Hay, joined him for a fourth time yesterday. “Yeh, I guess we’re still a bit rusty, but we’re getting better too,” he said. A further 20 seconds behind, Lincoln Crowne completed the podium, as it also did last week. In fact, last week’s top five were replicated exactly yesterday. 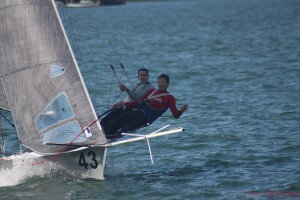 The Parramatta River Championship was a preview of things to come in the 12ft Skiff NSW Championship, which gets underway on the last weekend of November at the Sydney Flying Squadron at Kirribilli. It should suit Kirribilli resident Andrew Hay nicely. This entry was posted in News, Race Reports on October 26, 2015 by skiffed_2.